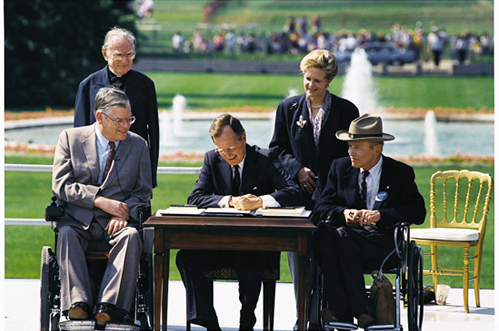 The Americans with Disabilities Act (ADA) is poised to celebrate its 25 years as a signature piece of American civil rights legislation on July 26th. To ensure that the commemoration offers more than a single day of champagne moments, for the past three years the ADA Legacy Project has been busy assisting with a series of projects and events designed to preserve, celebrate and educate about ADA. The festivities will provide both moments to reflect upon the past and offer stepping stones to envision a still brighter future for people with disabilities. Therefore, in 2012 with the blessing of the Shepherd Center where Johnson is employed, a small group met in that facility to set goals and begin the project. Their hope was to forge a unified approach to this process with all of its stakeholders and build an infrastructure that would remain at work well after the celebrations on July 26, 2015. In conjunction with this vision, the role disability rights played in the civil rights movement would be an important theme of the project. Johnson remains ever-mindful of the relationship between Legacy and the struggle. That understanding, in fact, shapes the partnerships the team has created. If you or your group wishes to partner with ADA Legacy for future projects, instructions are located on the website at http://www.adalegacy.com/get-involved/become-partner. The ADA tour features interactive exhibits designed to draw people with disabilities of all ages and cultures. Courtesy of the Museum of disABILITY History, Legacy bus visitors will first see a four-panel display on the history of self-advocacy. They may read about the ADA Legacy Project and learn more about its efforts to preserve disability history, celebrate major milestones and educate future generations of disability advocates. There is also a booth where advocates may post their thoughts and a photo, relating the difference the Americans with Disabilities Act has made in their lives. The tour bus also features the ADA quilt which is available for advocates to sign, as thousands have before them, a testimony to how many have experienced the tour and many other Legacy projects.The ADA Bus was originally procured for the 2006-2007 Road to Freedom, a tour that promoted the importance of the 2008 amendments to the Americans with Disabilities Act. Both the bus restoration and its re-wrap (new pictures and logos applied to the truck exterior) were undertaken by Andy Houghton and the U.S. Business Leadership Network. 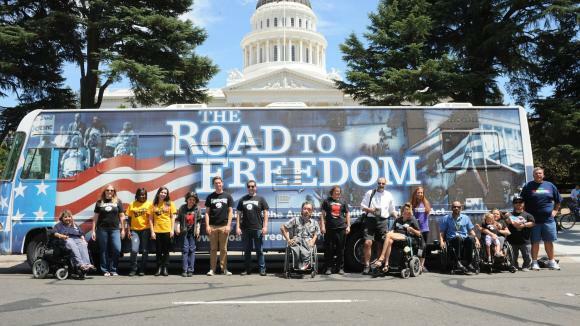 The 2014-15 California tour was launched under the leadership of Christina Mills, Deputy Director of the California Foundation for Independent Living, and Sarah Triano, Executive Officer at the California Committee for the Employment of People with Disabilities. Mills and Triano also coordinated the spirited kick-off event at the capitol building in Sacramento. Now managed by the ADA Legacy Project, the bus has partnered with many sponsors and organizations around the country to accomplish this extraordinary effort. The bus has covered more than 21,000 miles, driving through 30 states, with stops at city halls, public gathering places, disability organizations, public schools, universities, disability conferences and Abilities Expos. The numbers of people touched at any one stop vary widely. In Greenville, South Carolina, for example, an EXPO planned by 25 local groups drew about 800 people. One of those South Carolina visitors was an occupational therapist and member of the American Occupational Therapy Association. She requested that a stop be organized at the AOTA gathering in Nashville. With the American Occupational Therapy Association’s cooperation, the Legacy tour bus parked at the conference headquarters. During that single stop, Legacy recorded over nine thousand visitors. Keeping Legacy up and running also requires diverse collaborations. Johnson is no stranger to energetic fundraising and his convictions are clear: “When you start organic, you begin with partners. Some of them become sponsors. Our two founding sponsors were Amerigroup Foundation and Shepherd Center, my employer. However, a lot of our funding comes from individuals—small donors. Most comes through host fees and merchandise sales. There is a place on the website to purchase t-shirts and tattoos and other “swag” with the ADA Legacy logo. Other items can be customized, with a home state insignia, such as the state of Texas, which added a lone star, and Alabama which has emblazoned the whole state name on ADA shirts. Since its passage in 1990, the Americans with Disabilities Act has impacted lives on every level: personally, nationally and internationally. Mark Johnson notes that this vital piece of legislation has helped change individual and group attitudes, given pride to the disability community, and created the passage way for many more policy related victories in employment rights and community living rights. Personally, he has felt its positive impact in the range of everyday conveniences that make life in our communities an equitable experience: the increase in available parking for people using mobility devices or for others who cannot manage distance and required parking; the fair hiring practices in the job market; and freedom and fairness in his decision to live wherever he chooses. The content of the Conventions on the Rights of Persons with Disabilities that most countries have signed is founded on our ADA. Above all, the Americans with Disabilities Act has and continues to provide a platform for hope for even more improvements in the future. When the ADA was passed 25 years ago, the primary tools of information dissemination, in addition to media contact, were postal mail and the telephone. Johnson explains that, “Now we have the web, Facebook, twitter and more” to expand the organization’s engagement with the world. Utilizing both local and national coverage through its partners, as in the recent efforts of New York City that escalated from a parade to honor a person with a disability that has escalated into a month-long celebration of achievements of persons with disabilities. Such efforts have helped circulate the ADA message throughout newer media outlets. Today, instead of the telephone, there are new tools –twitter’s hashtag, and facebook for example.”Legacy plans to develop a tweet campaign in the weeks just prior to the anniversary date of July 26. If you use the internet, be sure to check out their site and “like” it –https://www.facebook.com/adalegacy.. Creating a generation of new advocates means communicating through media these young people prefer. Mark Johnson understands this: “Young people in particular are users of these newer media. However, it is not only the media we are transforming, we are also retooling the message, developing new strategies. The young are eager to want to know not war stories of past victories (although that is important to archive) but also the why of how things came to be what they are today and then how they can effect change in the future.” After the July 26 launch, plans are already in place for the Disability Rights Center to manage the Road to Freedom Tour and for USBLN to manage the Disability Rights Museum on Wheels. However, the ADA Legacy Project will still play a role. The full scope of that role will depend on their budget, but Johnson anticipates continuing at least as an advisor, convener and facilitator as well as the manager of other projects such as archiving ADA25 and The ADA Legacy Tour, finding a home for NCCHR’s ADA25 photos exhibit, and continuing to coordinate with the University of Georgia and the Georgia Disability History Alliance. In addition, the group will continue to promote its core mission of preservation, celebration, and education, market and sell disability pride products, and work to develop a disability advisory committee for NCCHR, similar to their women’s group. Note: The Hershey poem can be found here: http://disabilityvisibilityproject.com/2014/12/01/poem-by-laura-hershey-you-get-proud-by-practicing/. Article edited by Kim Slaughter White. SMG Tip: Disability Marketing is for Small Business, Too! Did you know that small businesses make up 23% all business in the U.S., but they employ 50% of the working population? In an environment where companies – large and small – are trying to be heard and seen in a crowded marketplace, small businesses have an opportunity to stand out when reaching an untapped consumer group – people who have disabilities, their families and friends. The truth is that people who have disabilities and their family and friends need the same products and services as non-disabled people. So if you own a carpet cleaning business, a service station, beauty salon, or dry cleaner, there are some things you can do to connect with this market to build a life-long relationship with them. The payoff is big and can result in increasing impact and your company’s income. We suggest small businesses consider micro targeting the disability market so the impact can be measured and you understand what works. One in 5 people have some sort of disability or chronic health condition, according to the US Census. It’s safe to say that many people are your email list, or that come into your business are, or have someone in their lives who has a disability. Find out which of your existing customers is impacted by disability. Find out what’s important to them and zero in on creating your product/service offering on the right niche of consumers. It may be parents who have a child with a disability, or adult children who are primary caregivers for aging parents. We suggest you get as specific as you can and target your ideal customer. Once you’ve identified your ideal customer/s, it’s important to know where they hang out or congregate. One tip is to identify many disability organizations in your city or region and contact them. Or, you may consider contacting the school districts where you live and building relationships with the Special Education department to begin the process of being a trusted company for families to rely upon. This process may take time to nurture, but it’s the best way to build credibility, by gaining access to your ideal customers through a trusted organization. Nobody likes to just be sold to. Determine what your company can do to provide unique value for customers who are impacted by disability. You may include information on your website, or host a day for them where they can obtain value-added information that is unique to their circumstances. Whatever it is, be sure to provide content (on your website or your email list) or an additional service that is life enhancing. For example, if you are a dentist and you specialize in providing caring services for kids with developmental disabilities and oral aversions, you may provide an email that includes dental hygiene for the kid who doesn’t want a toothbrush in his/her mouth. Or, if you own a hair salon you may consider targeting Mothers who have kids with autism or other developmental disabilities. You know that these women want to be pampered like Moms of typical kids. You could reach them through schools, or local disability organizations and dedicate a Saturday each month where they and their kids can come in and get their hair cut in a safe environment where they won’t be stared at, and any behavioral challenges are handled well. Lastly, the key to successfully reach and serve customers with disabilities is to be consistent by creating a schedule that keeps your efforts on target. Start by adding value and building the relationship. Once customers have a good experience with your company, they will tell their friends. Gaining a new customer base doesn’t happen overnight. But with just a little effort, your business can gain a new, loyal customer base. Ready to get started? Contact Celeste Beaty at cbeaty@disability-marketing.com to schedule a 30-min consultation with Solutions Marketing Group.